What can computers do in principle? What are their inherent theoretical limitations? These are questions to which computer scientists must address themselves. The theoretical framework which enables such questions to be answered has been developed over the last fifty years from the idea of a computable function: intuitively a function whose values can be calculated in an effective or automatic way. 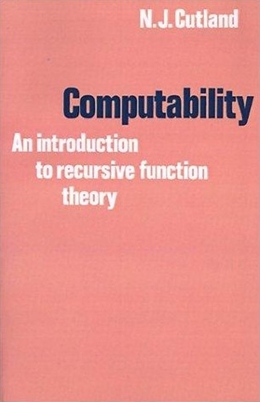 This book is an introduction to computability theory (or recursion theory as it is traditionally known to mathematicians). Dr Cutland begins with a mathematical characterisation of computable functions using a simple idealised computer (a register machine); after some comparison with other characterisations, he develops the mathematical theory, including a full discussion of non-computability and undecidability, and the theory of recursive and recursively enumerable sets. The later chapters provide an introduction to more advanced topics such as Gildel´s incompleteness theorem, degrees of unsolvability, the Recursion theorems and the theory of complexity of computation. Computability is thus a branch of mathematics which is of relevance also to computer scientists and philosophers. Mathematics students with no prior knowledge of the subject and computer science students who wish to supplement their practical expertise with some theoretical background will find this book of use and interest.